This article was one of two features that appeared in the Summer 2018 issue of Waterproof! 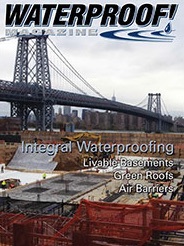 Magazine, a trade journal covering residential and commercial waterproofing. The other was on air barriers. Read the article as it appears on the Waterproof! Magazine website or view the article PDF. When it comes to your finished basement, some of the most important decisions are made for wall and floor systems behind the scenes, for what goes on underneath your couch, pool table and drink station that no one else will ever see. But once those are made, you can rest assured that your carpet, furniture and whatever treasured objects you have stored down there will remain in good shape for years to come.